The Burton Review Rating = 5 stars! "Juana of Castile, the last queen of Spanish blood to inherit her country’s throne, is an enigmatic figure, shrouded in lurid myth. Was she the bereft widow of legend who was driven mad by her loss, or has history misjudged a woman who was ahead of her time? In this stunning novel, C.W. Gortner challenges centuries of myths about Queen Juana, unraveling the mystery surrounding her to reveal a brave, determined woman we can only now begin to fully understand." This is the story of a daughter of the infamous Ferdinand and Isabella, who was branded with the name Juana the Mad. Being told in first person through Juana's eyes made the read more enjoyable and the writing flowed flawlessly from page to page. The novel begins at the youth of Juana as she adapts to her duties of being a member of the royal family in Castile and Aragon. We follow her as she marries and has children. Unfortunately for her, life is not as grand as it should have been, for Juana was surrounded by people who used her for her status alone. She and her siblings were bred as pawns for future marriages and never had a chance at living for themselves. Juana was made painfully aware that her first duty was to Spain, and to her mother's prized Castile. She initially fell in love with her husband, Philip of Flanders, and happily gave him children, until she was forced to defy him due to his power hungry ways. Unexpectedly and probably the most heartbreaking realization for her was the fact that her father was using Juana once the Queen Isabella died. Juana held fast to her beliefs and stayed strong in her resolve in order to secure the succession for her sons, and to honor the wishes of her mother Isabella. Gortner does a fine job in showing the strength of Juana's resolve and her unwillingness to back down. She had never expected that through one tragedy after another she would even have to ascend to the throne, as she was not the first in line. Although Juana resisted her fate as queen, she finally understood what her mother had been working for her entire life. Juana, the last Queen of Spanish blood to inherit the throne, was never able to feel at peace in her life, there never seemed to be someone that she could trust with her life. Everyone about her had their own agendas, and even her eldest son had a hand in keeping her imprisoned. The emotional upheaval that Juana felt time and time again may have contributed to outbursts that probably lead to the stigma of being 'mad', and one could not blame her even if it were true. The novel does not outright say whether or not she did go mad, and it doesn't support or deny it. I am someone who's favorite thing to read is Historical Fiction. I therefore could be biased in the review because of that, but I do not hesitate to recommend this to anyone else interested in Historical Fiction, European history, Castile and Aragon or simply the King and Queen of Castile. I only knew snippets of Juana's reality, and I found this novel on Juana La Loca to be enthralling. I enjoyed learning more about Ferdinand and Isabella as well, I was quite surprised with the political outlook of Ferdinand. 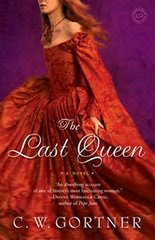 This was literally a page-turner, I was so wrapped up in the story of The Last Queen I did not want to put it down, nor did I want it to end. I am not a connoisseur of European history so I cannot attest to the facts of the events that C.W. Gortner wrote. But the fact that the story was told so exquisitely was enough for me. I could not find any faults with the book, and I am waiting with bated breath the next C.W. Gortner release which is about Catherine De Medici. There is a very interesting Reading guide at the end of the book, where certain points are explained that I enjoyed also. Please see the Guest Post that C.W. Gortner is going to share with us! I am so excited to learn even more about Juana through him! I will list all the blog tour stops on tomorrow's Guest Author Post!